if youre on a tight budget and are willing to live with a degree of compromise, this may well be the machine for you. Rather than opting for a high-end offering, the Hi-Grade Notino D7000- 1602 comes in at a budget-priced £899 (inc. VAT) which, considering this is a brand new product, is something of a feat. Naturally, you won't find a high-end chip at this price, but the Core 2 Duo T5500, which runs at 1.66GHz, more than keeps things ticking over. Backed with 1024MB of DDR2 memory, this chip can handle tasks with ease, but initial benchmarking proved less impressive than expected. MobileMark 2005 doesn't fully support dual-core testing, so the score of 227 is only a rough guide. Cinebench handles dual-core testing, but even the score of 456 is lower than we expected. This processor is at the lower end of the range and comes with the standard 2MB of Level 2 cache. 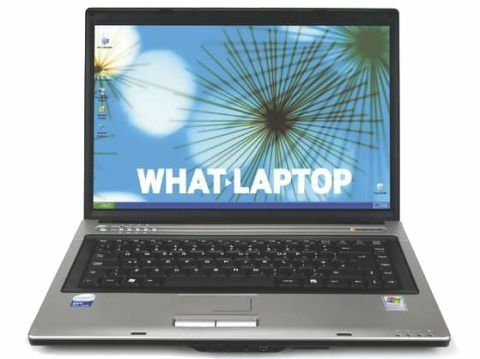 In day-to-day use, it proved a satisfactory laptop, handling tasks well. When it came to heat, we found the system grew quite warm to the touch, especially on the left-hand side, but this could be down to the inclusion of a dedicated GPU as much as the CPU. Fortunately, it ran quietly, with no noticeable noise coming from the machine, except from the optical drive, which tended to rattle when a disc was spinning inside. The build quality is a mixed bag with the main chassis feeling solid and quite firm to the touch, even at its tempered front edge. However, what let this machine down was its rattling keyboard, which felt rather loose in its mountings, although Hi- Grade assures us the retail models won't suffer the same flaw. Better quality are the mouse buttons and touchpad. Weighing in at 2.8kg, there is a reasonable amount of mobility to be had here, but this wasn't reflected in its battery. Under test, the unit lasted for 159 minutes, which is a 10 per cent improvement over the Core Duo version of this model, but still falls short of our expected three-hour minimum threshold. The 15.4-inch TFT screen is a standard panel, so you won't find a glossy coating, which helps keep down reflections, but images aren't as sharp as you'll find on a Super-TFT panel. The panel is supported by the nVidia GeForce Go 7900 GTX graphics adapter, which is a good mainstream option, as highlighted by the 3DMark 2003 score of 4051.